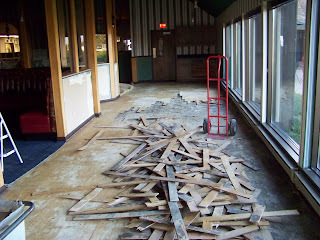 Underneath the old carpet we discovered the original hardwood floors from when Barkers was built in 1981. Unfortunately it was beyond repair so we began ripping it out as well. We got more accomplished today than I anticipated so I am hopeful that trend continues the next few days and we can re-open sooner than anticipated.